Let the good times roll. 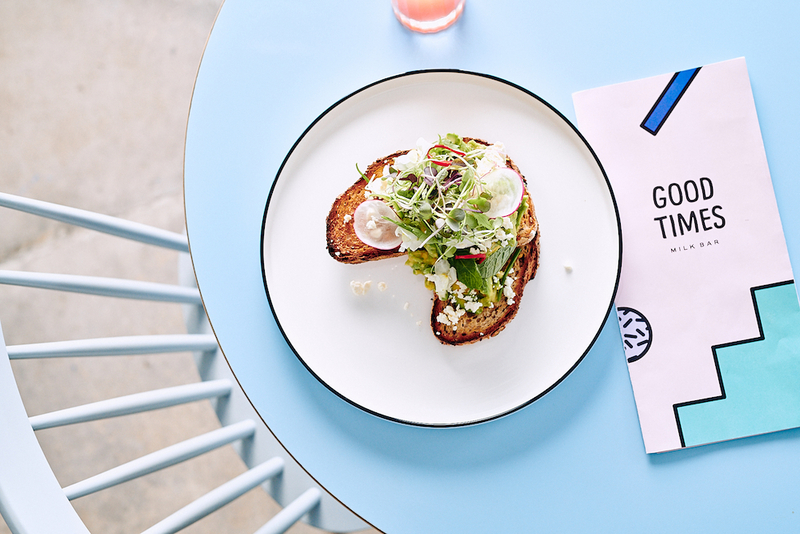 Bayside’s latest eatery, ​Good Times Milk Bar opens its doors 0n 15 March. 2018. Good Times Milk Bar located in Melbourne’s Bayside suburb Bentleigh, was a diamond in the rough. Previously a rundown corner & convenience store, the Good Times team gutted and refurbished the space, converting the venue into a fun and approachable cafe while keeping the heritage corner-store exterior and traditional overall feel making it the new neighbourhood local. The design brings in pastel colours, Palm Springs pink and French blue paired with pattern and texture channeling a contemporary feel and a sense of warmth in the environment. With a vast amount of seating inside, park bench banquettes and booths or a ‘dog friendly’ courtyard out the back with a large grassed area, there is plenty of space to sit down and dig into a ​GTMB Beef Burger and sip on a ​Golden Gaytime Milkshake​. The space is branded with key artworks that are displayed in the simplest form with matching colour, pattern and clean line work showcasing the graphic art style designs created by ​Hours After complimented through the use of plants from ​Glasshaus Nursery. Keeping with the theme, Good Times Milk Bar’s food and drink service has the same feel as the space – all about Good Times. 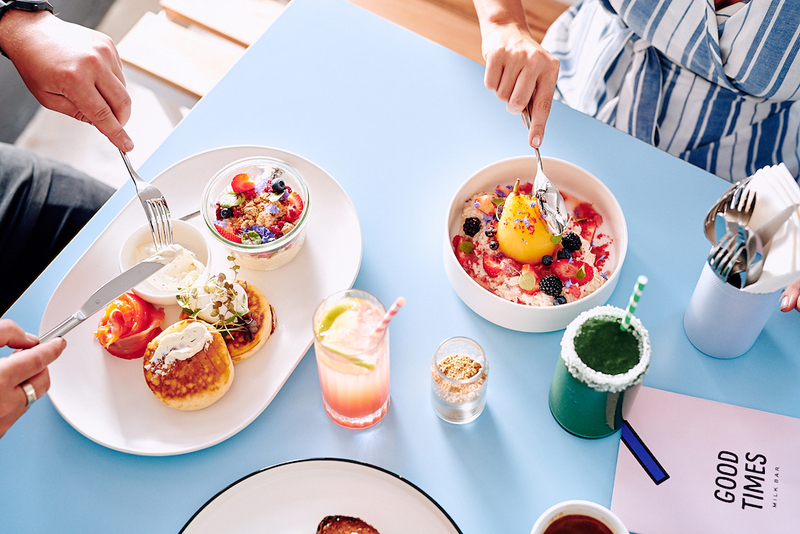 Serving all day breakfast, lunch from 11am, daily market sandwiches, bite sized sweets & diner style shakes, Good Times Milk Bar is the new kid on the block. Key dishes you will find at Good Times Milk Bar include; Meatsmith Pastrami Benedict served with potato waffle, poached eggs, brown butter hollandaise and dill pickle, the Ricotta Hotcakes ​with berry compote, meringue crumb, ice-cream, spiced maple syrup and popping candy or the ​Moroccan Eggplant served with harissa spiced lamb, a poached egg, smoked labneh, hazelnut dukkah and flatbread. 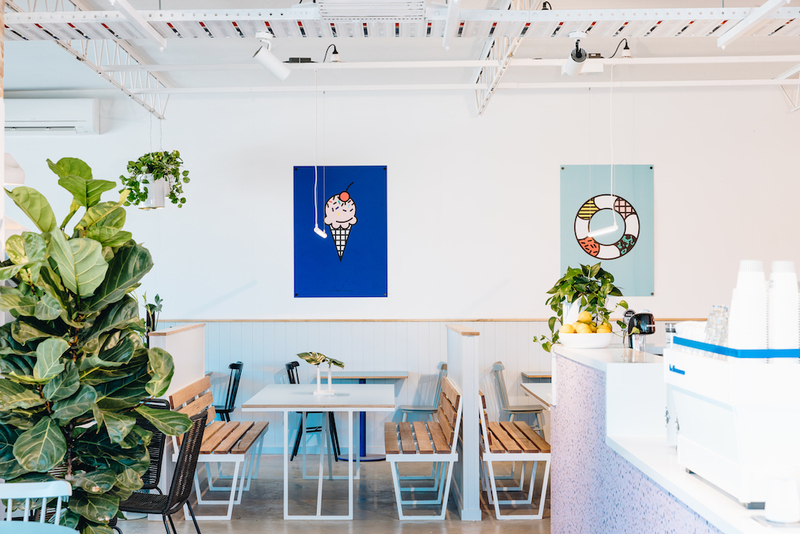 Signature Good Times Milk Bar drinks include the ‘special milkshakes’ (​Golden Gaytime, Lamington or Peanut Butter & Chocolate​), two smoothie options plus the ​Golden Latte ​with coffee by ​Small Batch.